Smart Tag Packaging is also known intelligent packaging, interactive packaging or active packaging. A smart tag has an advantage of having the wide range of application over traditional bar codes. Smart tag is to draw the attention of consumers or provide authentication or additional information on the product; Smart packaging brings many benefits to consumer whether, it is product description, MRP, bar code and expiry date. The global smart tag packaging market is expected to showcase a significant CAGR of 4.6% during the forecasted period 2018-2027. Smart tag plays an important role in supply chain management by enabling the manufacturers and suppliers to keep track of logistics and optimally maintain the inventory level. The global smart tag packaging market is segmented into type, verticals and geography. In terms of regional platform, Europe region is believed to dominate the global smart tag packaging market aided by Western Europe countries such as U.K., France, Netherland and others. Online transaction is expected to increase while positively influencing the smart tag packaging market. Changing consumer lifestyle and increasing installation of modern retail outlets have boosted the growth in smart tag packaging market. Further, Smart packaging can change the way retailers, brand owners and consumers interact with products by communicating, engaging customers, managing inventory systems and much more. 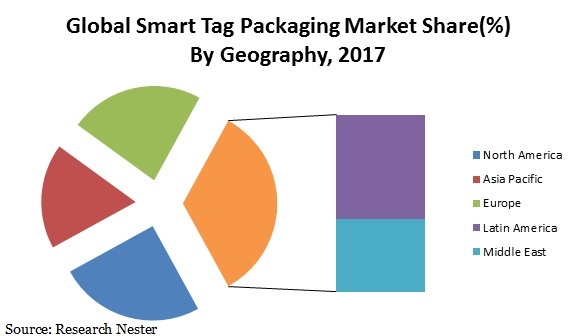 Rising consumer awareness about the packaging of consumer goods and electronic goods is anticipated to positively impact the growth of smart tag packaging market.Contrariwise, high cost of smart packaging tag is expected to hamper the growth of smart packaging tag market. Further, lack of standards and unawareness about the product is restraining the growth of the market. Shenzhen Jianhe Smartcard Technology Co., Ltd.
Shenzhen Zdcard Tech Co., Ltd.
Shenzhen Top tags Technology Co., Ltd.
Zhejiang Laxcen Information Technology Inc.